Earlier this week, Tess Kalinowski reported in The Star that Halton Region, a fast-growing region west of Toronto, would simply stop approving new developments without more provincial support for transit and other services. Chair Gary Carr wants to see funding for transit – including two-way, all-day GO rail service – not to mention schools, roads and public health. Halton’s population of half a million is planned to grow by 50% in the coming two decades as new residents pour into the Greater Toronto region, but the infrastructure to support them does not exist. This problem is shared by other municipalities either because they face growth of their own, or because they lie between newer neighbourhoods and downtown and absorb increases in travel through older parts of the GTHA. Metrolinx had originally slated all-day service for Halton on the Kitchener and Milton GO lines in the first 15 years of its 25-year Big Move transportation plan. But the plan’s updated version pushes the GO expansion to the list of projects in a 16- to 25-year window. Besides more GO trains to Milton and Georgetown, Carr said the region wants Metrolinx to reinstate plans for another GO station on Trafalgar Rd. and it wants the Lakeshore West GO line electrified so it can deliver 15-minute express service. Municipalities in the 905 now have (or are planned for) populations and the transportation demands they will create that exceed the capacity of road-oriented development. Even if transit in the 905 (and commuting capacity for 905-to-416 travel) were much better, the land use patterns work against effective transit service. This is not just a question of dispersed work and home locations, but of neighbourhood designs generally where stops to run errands as part of larger trips demand the use of a car. These problems will not be wished away with better bus routes or all-day GO service. Halton, like many regions, is reacting to proposed new region-wide “revenue tools” with the question “what’s in it for us”, but this is a natural result of the “Big Gap” between the original promise of Metrolinx (and of provincial plans for managing GTHA growth) and what is actually happening on the ground. Various plans exist for the expansion of GO Transit service, and these have changed from time to time leaving some confusion about what, exactly, will be provided and when service expansions will occur. Back at the dawn of time, before The Big Move had been published, many transit agencies created plans that would feed into the new regional plan. GO2020 was GO Transit’s contribution (Transit City was the City of Toronto’s). At the time, GO and Metrolinx were separate agencies – one ran the trains while the other drew maps. Frequent service – On primary corridors, a train or bus departure at least every 15 minutes during peak periods and 30 minutes in the off-peak periods will serve a full range of travel needs. Competitive travel times – Travel times on both train and bus will be competitive with automobile travel. Express and limited-stop service, and priority measures for buses, will ensure that GO is an attractive option. Peak-period train service – By 2020, GO Transit’s rail corridors will be serving diverse travel needs, with significant amounts of traffic against the peak direction and between outlying activity centres, in addition to the high volume of passengers to downtown Toronto. Two-way, all-day service will be provided within the Core Service Area. Services will extend beyond to serve more distant Urban Growth Centres as appropriate. • High-frequency, peak-direction trains in Core Service Area – GO will expand Built-Up Area peak-period service on the existing corridors to offer a train at least every 15 to 20 minutes in the peak direction on all existing rail lines, supporting the intensified development envisioned in the Growth Plan for the Greater Golden Horseshoe. This level of service is designed to fully develop the 2020 work travel market in each corridor from the regions outside Toronto to the immediate Union Station area. The goal is to attract 80% to 85% of these travellers, with corresponding increases in travel to the broader area around downtown Toronto. When demand justifies more than four trains in the peak hour, GO will introduce express trains and offer a peak direction train at least every 15 minutes for each station. With GO’s high-speed, interregional services, departures more frequent than every 15 minutes would not attract significantly more customers. However, introducing additional fast express trains instead (with few or no local stops en route, and average operating speeds ranging from 75 to 85 km per hour) would result in a more attractive service and improved ridership. The number of trains arriving at Union Station during the morning peak hour will more than double to meet the demand for regional rail service. Inbound ridership for the year 2020 will increase due to population growth in GO Transit’s regional markets, enhanced service on all corridors, and GO’s expanding market share, even if the number of jobs in downtown Toronto does not increase dramatically. Significant changes in the relative cost of driving vs. taking GO, fare integration with the TTC, or public acceptance of transit use could result in even higher numbers. To meet demand, trains will have to arrive at Union from the Lakeshore East and West lines nearly every five minutes, from the Milton line about every eight minutes, and every 12 to 15 minutes from each of the other corridors. This high concentration in the peak hour will need a substantial increase in Union Station’s capacity for trains and passengers. It will drive construction of track and other infrastructure improvements, including passenger stations and terminals, rail and bus corridors, vehicles, and support facilities, which are addressed in the MoveOntario 2020 capital investment plan and the Metrolinx RTP. Customers travelling to workplaces and other destinations outside downtown Toronto, or between stops along the corridor, will have a regular schedule of counter-peak trains every 30 minutes or less. • More train service options – To improve access to the Core Service Area, GO will introduce trains along rail lines it is not currently using. 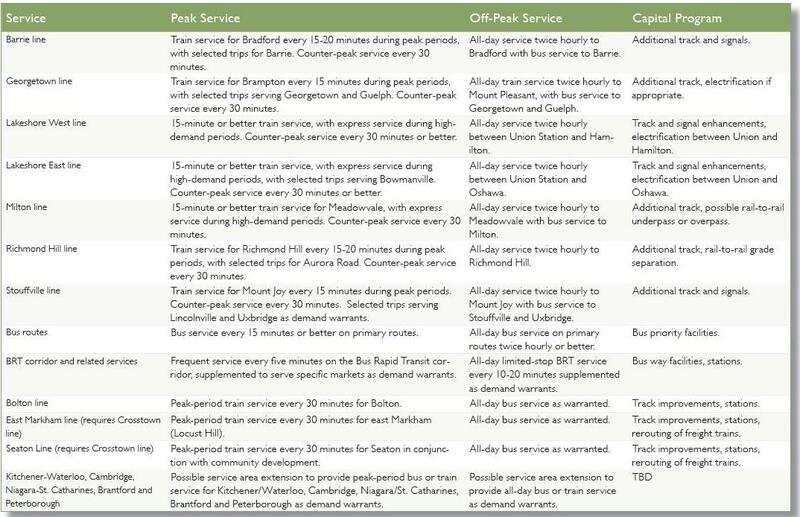 Peak-period GO Trains will operate between Bolton, Seaton, East Markham (Locust Hill) , and the Yonge/Summerhill area. These improvements are consistent with the Metrolinx initiative to optimize use of existing rail infrastructure. All of this is summarized in a table at the end of the report. This entire list was included in GO’s 2020 plans, a timeline well within the original 15-year window of the original Big Move, but the actual plan delivered these services over a longer build-out than GO had proposed. In the case of Milton, The Big Move offered less service than the GO2020 plan would have provided. Some rail corridors could not be easily exploited for GO service especially at the frequencies proposed in either the GO or Metrolinx plans. The combined capacity of a fully built-out system coming into Union Station exceeded that terminal’s capacity even after the massive reconstruction now in progress. Use of the CPR tracks through central Toronto would require a transfer point to the Yonge University subway at a location where it has no capacity to accept additional riders. The provincial agencies were good at drawing lines on maps, but not quite so good at understanding the limits of the infrastructure. Moreover, the scale and speed of GO improvements was to be considerably slowed in The Big Move probably to stretch out funding requirements. In The Big Move, the 15-year plan offers “Regional Rail” service on the Milton corridor with full day, two-way service. By the 25-year plan, this is upgraded to “Express Rail” (very frequent service) as far as Meadowvale. Recent updates to The Big Move push the “Regional Rail” service off to the 25-year plan, although the “Next Wave” plans do include all-day two-way service to Meadowvale. More generally, those “15” and “25” year markers are slippery and in the revised Big Move, count from “today”, not from the original 2008 plan. 25 years now means 2038 compared with the original 15-year goal of 2023, and the GO2020 goal of 2020. Halton has good right to be annoyed. The new revenue tool package will be a hard sell across the GTHA not just because it means new taxes when the mantra of past decades has been that we cannot afford any of them, and that cuts in spending take precedence over all other policies. That sales job is not helped by the less than forthright planning by Metrolinx and GO (now one agency). Services that might have been delivered in the near future drift off beyond the lifespan of all current governments and the imaginations of most taxpayers. There is no sense of what we will really build and when we will see the benefits. The Next Wave of Metrolinx projects will consume about $22-billion in capital. The proposed funding scheme includes $2-billion annually from new revenues, of which 25% will be diverted to municipalities. This leaves $1.5b per year and makes the Next Wave roughly a 15-year project (not including inflation or future operating costs). Roughly half of the total will be consumed by two subway projects, the Downtown Relief Line and the Richmond Hill extension. These are so large that they belong in a separate category, possibly with a different funding strategy. Metrolinx must pull together a coherent overview of its many plans and promises, together with a realistic evaluation of the constraints that exist on network growth. If we really are going to see a benefit from new revenues, this must be measured against clear, achievable plans, not a grab-bag of schemes with vague implementation dates. Just as Toronto saw its ambitious Transit City plan scaled back and delayed, the hopes for GO2020 have been diluted. Halton and other regions have every right to distrust that transportation plans essential to their future will actually materialize. Population and congestion growth will not pause just because Queen’s Park lacks the will to be honest about the scope of spending required. The coming Investment Strategy must be more than a one-page report with a list of three or four potential taxes. It must really explain what the “investments” will buy us, when they will be delivered, and what benefits we will see across the GTHA. Anything less is an abdication of Metrolinx’ and the Government’s responsibility. This entry was posted in A Grand Plan, Beyond 416, GO Transit, Transit. Bookmark the permalink. Glen Murray just announced that GO will be starting 30-minute service Lakeshore Corridor 7 days a week – of course, Burlington and Oakville will be enjoying this level of service, and at least those two municipalities have somewhat reasonable, 7-day/week bus services that connect to the trains and to adjacent systems in Hamilton and Mississauga. Milton only has Monday-Friday bus service (apart from the GO bus), centred around the GO station. Milton, which grew rapidly since 2001 entirely due to getting pipelines built by Halton Region to bring in lakewater and process wastewater, wants to build a post-secondary campus (doesn’t everyone? ), but their bright idea is to build it at the far southwest corner of the new urban area, a good 30 minute bus ride from the GO station if traffic is good and the bus is direct. Halton Hills’ only transit is the GO bus through Georgetown and Acton. Georgetown commuters wouldn’t be badly served with local buses running to Mount Pleasant GO, which isn’t that much farther than Georgetown Station from parts of Georgetown’s urbanized areas. Neither of the two northern Halton communities should complain when they can’t get their own houses in order. … even though electrification is not necessary for 15-minute service. Or any frequency, for that matter. Frequency is limited by track layout and signalling, not the energy source. (Union aside, the signalling on the Lakeshore lines can support 5-minute service). That said, it’s heartening that Halton recognizes the need for improved transit. Maybe that might encourage its municipalities to improve their transit services! Halton really is being hit hard by growth not keeping pace with infrastructure. Milton is the fastest growing area in Canada (according to the last census) and the population has grown to the point that peak period congestion on the 401 starts at James Snow Parkway. Ten years ago 680 News would report congestion beginning at Mississauga Road. Surprisingly there are still only 2 high schools. Oakville’s Oak Park and North Oakville subdivisions have paved everything on the south side of Dundas St. and Dundas is being widened to 6 lanes. There is a sports centre and new hospital being built on the north side of Dundas, and soon those amenities will be joined by housing up to the 407. Burlington is growing more slowly but it is pretty much built out based on low suburban densities. Transit in all of these places is, of course, inadequate. Every bus that can be offered is quickly filled, especially the shuttles to GO stations. There is also a growing demand for GO bus services, and I can imagine the 407 buses will be full once the subdivisions open up north of Dundas St.
Aside from rail services to Toronto, I can see demand for bus services to other parts of the GTHA. In some ways Burlington is a suburb of Hamilton, while while Georgetown can be a suburb of both Brampton and Milton. Halton is, after all, well-placed between Toronto, Hamilton and Kitchener-Waterloo. Although the GO2020 plan was pretty impressive when first introduced, it seems that it is missing some components that would encourage people to use GO to make those long distance and regional trips that are not bound for Union and Downtown Toronto. One question I’ve got to ask is, how would GO have been able to accommodate all the rail movements proposed for GO2020 as even with the upgrading of Union Station there would not be enough room. Is this where Metrolinx’s proposed Bathurst GO terminal came from? PS. If Metrolinx wants to save themselves a lot of trouble they should fund the construction of the Oakville segment of the Dundas BRT now, so that people in North do not get used to driving on those extra lanes. I cannot imagine the hostility that will erupt if the lanes are ‘given, then taken away.’ Better to never ‘give them’ in the first place. Politically this would be a good way to placate the Mayors of Oakville (and Mississauga if they build the Kipling regional terminal). Steve: The Bathurst terminal came from the recognition that all of the proposed service (and passengers) would not fit through Union Station. Oddly, there is no project identified in any of the plans to actually build this station, and its operation depends on the DRL swinging south to link it with the core. I just saw the Go announcement too about the 30 minute service on the Lakeshore Line between Oshawa and Aldershot. The last stop at the west end of the line wasn’t mentioned anywhere though, so should I assume that the schedule to Hamilton is unchanged? I don’t think it would be reasonable to expect half hourly service through to Hamilton given the single track tunnel etc. but I would’ve thought it would have been possible to put through a few more trains than the current three in the morning and three in the evening. It would’ve been nice to see Metrolinx make some mention of the last stop at Hamilton and what’s planned for service there and what obstacles specifically held up applying the service increase to the whole length of the line. With respect to Halton Region, I don’t think their position is unreasonable. Metrolinx and Queen’s Park both have established a huge credibility problem arising from massively underdelivering on their promises. Halton Region’s reluctance to approve development that the transportation system can’t adequately handle when the improvements required keep getting pushed off into the future with the vague promise that something, somewhere will be built sometime starting 15 years from now to be ready in 25 years, is understandable. What happens if Queen’s Park and Metrolinx decide to push stuff off into the 25-50 year plan? Or the 50-100 year plan? It’s a valid concern when Queen’s Park/Metrolinx’s track record consists of operating an existing transit system (Go), a fare card that belatedly catches up to where the rest of the world was 10 or more years ago (Presto), an airport service that’s still in the works that misses the widest markets for transit service out there, scaled down projects (Transit City, others) and delayed projects (almost everything) and a service increase on most, but not all, of the Lakeshore line. I sure wouldn’t be making any commitments based on what QP/Metrolinx are saying they’re going to do either. Metrolinx and Queen’s Park did have a chance to establish some credibility when Transit City got put back on after Rob Ford tried to kibosh it by building one of the light rail lines that’s relatively simple to construct and get open within a couple of years. If serious work on Finch or Sheppard was underway now with an opening date soon, QP and Metrolinx would have begun establishing a reputation for delivering actual, tangible, usable results. Instead, they went completely in the opposite direction and their reputation with it. The Bathurst terminal came from the recognition that all of the proposed service (and passengers) would not fit through Union Station. Oddly, there is no project identified in any of the plans to actually build this station, and its operation depends on the DRL swinging south to link it with the core. On that note, it seems to me that Metrolinx has made no announcements about Mobility Hubs other than saying where they are going to build them. There are plans for some of these hubs (Kipling and Renforth, for example) on the web but no PICs, roundtables, funding announcements, or construction dates being mentioned. I know that, logically the Renforth Gateway (at the Renforth/Eglinton/Matheson triangle) should be built and ready for when the Mississauga BRT/transitway arrives (2015 for that section, if I recall correctly) and the Kipling regional terminal should similarly be ready (for the Mississauga BRT/transitway and later, the Dundas BRT) … but I think that if that is the plan, construction needs to start this Spring or Summer…and nothing I have seen indicates that they are anywhere close to construction. Oddly, there is no project identified in any of the plans to actually build this station, and its operation depends on the DRL swinging south to link it with the core. As the move towards the next phase of the study looking at the options, my suspicion is that they are carrying the Bathurst Yard station (Option 4B) forward, simply to have an option to compare the other option too. (Option 6B – the option of building new platforms UNDER the existing platforms and concourses, which an interlined Lakeshore East/West would use). Still, this is all post-2020 stuff isn’t it (they said beyond 10 years)? I wouldn’t expect to see any actual plans to build it. Doesn’t the lengthening of certain platforms so that they can handle 2 GO trains (double berthing), and the new south platform (removing track 16) come first? The 30-minute service on Lakeshore is great news for those of us who use Lakeshore a lot off-peak! Do you recall how old this promise is? As far as I know, the current off-peak schedule (at least between Oakville and Pickering) is little changed since September 1967, and GO started to mumble about increasing service, shortly after the September 1967 service increase. Even with 30-minute service, we aren’t close to the frequency that Premier Davis and Transport Minister James Snow promised in the 1970s, as a trade-off for cancelling the Gardiner extension. But I can’t find much in terms of stuff from that time-period. Steve: Some of the service improvements and the new station are inextricably linked. Early GO plans, plus the service levels used for the Metrolinx demand projections would have required more trains than would fit in Union Station. Claims about the amount of traffic diverted to transit depended on a level of service they could not (and probably did not intend) to operate. This is one of the Big Gaps in the Metrolinx plans — the claim of preventing congestion from getting any worse depends on actually building and operating what they claimed, but as projects drift off into the future, this seems less and less likely. Also, of course, congestion won’t be improved/addressed uniformly across the GTHA depending on where new/improved services are operated. Better modelling, and considerably more transparency/honesty in Metrolinx planning, would address these issues, although not with the sort of message every region wants to hear. Electrification (except maybe for the ARL/UP Express) won’t happen this decade. First off, operationally the economics don’t make sense until then. Secondly, there are many more secondary impacts that need to be fixed before it’s considered (raising bridges, grounding fences, and Union Station capacity). As for Union Station, there are three options under consideration: double berthing at Union (would require substantial track work); a satellite station at Bathurst North Yard for Kitchener/Milton/Barrie traffic (would require all-day service rather than mid-day parking); a billion dollar tunnel under Union for Lakeshore East/West traffic (located east of Union Station). We probably need two or all three of these to handle all-corridor all-day 15-minute traffic. Halton will get better transit, but there are several key projects needing to be done in Toronto first. Not that I’m truly that familiar with the Halton area, being an SOB and a gashouse green i.e. I live in the TOcore, but maybe an intermediate means of mobility – if it was safer – would be biking from home to suburban transit stop. We under-estimate just how much could be done by bike, because many of us won’t try it. And it’s not safe. The GO doubling of service on Lakeshore is basically great news, and could it make a Big Difference to the Gardiner repair issue? It should. Along with Why isn’t there an EA for the west end repairs? and “Why doesn’t the Places to Grow Act apply to Toronto?” we now have the “Could we save $600,000,000 or spend $600,000,000 better than Gardiner repairs? Are there any politicians keen to save large sums? Steve: Like it or not, a bundle has to be spent on the Gardiner, even if we were only taking it down (which ain’t going to happen). Many, many trips carried by this road will never be replaced by cycling, not even to the point of allowing for a smaller Gardiner, for the simple reason that there is more demand for that road than space, and any diverted trips will always backfill with latent demand. With the Gardiner, there is another road directly underneath it, along with potentially much more transit along the railtracks, let alone a now-slimmer Front St. transitway or some other version, so I think we need a more thorough exploration and costing that also includes getting revenue from the users of this restricted-access freeway. It is quite unfair to have user pay for the TTC/GO/Island ferry with larger maintenance costs and capital costs borne by the taxpayers whilst Gardiner users enjoy the view and free ride. Even starting with a busway would be something. Why not? With the Gardiner, there is another road directly underneath it, along with potentially much more transit along the railtracks, let alone a now-slimmer Front St. transitway or some other version, so I think we need a more thorough exploration and costing that also includes getting revenue from the users of this restricted-access freeway. The EA for the Gardiner was announced in 2008 and mysteriously stopped in 2010. It has since been restarted. One of the ideas mentioned in 2008 was to shift a narrowed Gardiner onto an expanded railway embankment east of Jarvis St. and remove the elevated portion from east of Jarvis. Personally I’d like to see the Gardiner moved underground as part of a redesign of the Exhibition Grounds … instead of curving at Jameson and rising up after Dufferin, I’d like to see the Gardiner continue straight at Jameson and basically tunnel under the Exhibition grounds then continue under Lakeshore Boulevard. On and off-ramps could be built in the space occupied by the Gardiner as well as in other open spaces that are not occupied by buildings, and ideally could be built so cars can access the north-south roads, as well as Lakeshore and Fort York Boulevard without having to stop at traffic lights … of course road designs would be designed to facilitate pedestrian movements as easily as auto movement. The current design of Lakeshore Boulevard around the Exhibition could be replaced with a more urban road that connects the Exhibition and Ontario place, rather than a highway that divides them. Of course the challenge is that there is already a great deal of north-south barriers, both infrastructure (water mains, electrical cables an sewers) and natural (the Don River) … that a tunneled Gardiner and ramps would need to avoid. The SMART tunnel in Kuala Lumpur, Malaysia is an interesting example of a highway tunneling job done under a city. It is a 3-deck tunnel, with the top two decks reserved for traffic and the remaining deck providing a channel to divert water from the Klang River to avoid flooding in the city centre. In cases of extreme danger water can be diverted through the entire tunnel once vehicles have safely exited. Metrolinx has problem with being believed since they keep pushing all day service farther into the future. People are fed up with service improvements that are never delivered. Two way all day service has been hinted at for a long time to Mt. Pleasant, “As soon as we finish the upgrades.” Well I guess the upgrades are taking a lot longer than they thought, like another 15 years. I am glad that the Lakeshore line is finally getting half hour service. It only took 47 years for this improvement to finally happen. Hopefully GO will change their departure times from Oshawa and Aldershot because right now they have a 33 minute lay over in Oshawa and a 16 minute layover in Aldershot. It does look bad if you have 2 trains in Oshawa at the same time on a 30 minute headway. To only use a 3 minute turn around is unrealistic because the brake test for an end changes takes longer than that if it is done properly. It takes the trains 2 hours and 4 minutes to go from Aldershot to Oshawa and 2 hours and 7 minutes to go from Oshawa to Aldershot. I guess westbound passengers are slower to load and unload. Round trip running time is 4 hours and 11 minutes plus terminal time right now of 49 minutes for a total round trip time of 5 hours. This requires 5 trains. By cutting the total terminal time to 19 minutes they could reduce the round trip time to 4.5 hours and only requires 9 trains instead of 10. Now Metrolinx when will you give the rest of us even hourly off peak service? I agree with what Halton Region is saying. But at the same time, the region should push its own municipalities to rise to the challenge as well. Off peak transit service in Burlington and Oakville is dismal, with buses only every 30-60 minutes. You can’t get a bus after 7pm in Oakville or Burlington on Sundays. These local transit issues must be addressed. And I don’t agree with you Steve that improved bus services won’t have much impact. The 905 is built no different than the 416 suburbs. Yet the 416 suburbs have outstanding transit usage rates. And that because we have good bus service. Steve: That’s not what I am saying. However, small scale fixes won’t do, and the municipalities must get past the political difficulty that transit is seen as something used by a small minority and is a drain on taxes. Also, in some areas, the land use pattern is such that it will be very difficult to shift people to transit. These will be the hardest voters to bring around to supporting new transit spending. Brampton is showing us very well that providing quality public transit services will get 905 residents to ride. We should be asking why other 905 transit systems are not providing as good service as Brampton does. Brampton, YRT and Mississauga have elected to concentrate on developing service along major corridors, provide enhanced express service, and encourage transfers along the grid. This ensures that the high-demand, busy transit corridors are well-taken care of. However the problem of serving cul-de-sacs and ‘dead worm’ streets still exists … and it is a a major problem because for many people their transit journey begins with a winding, leisurely trip. Structurally, those areas will be the domain of the car for a very long time … and the only way to make things work is to subsidize the cost of alternatives to SOV trips out of those those neighbourhoods…fortunately these alternatives can range in cost … from providing mini-bus service or dial-a-ride or taxi chits, providing cycle-friendly infrastructure and direct walking routes, and even encouraging ride sharing and trip planning.